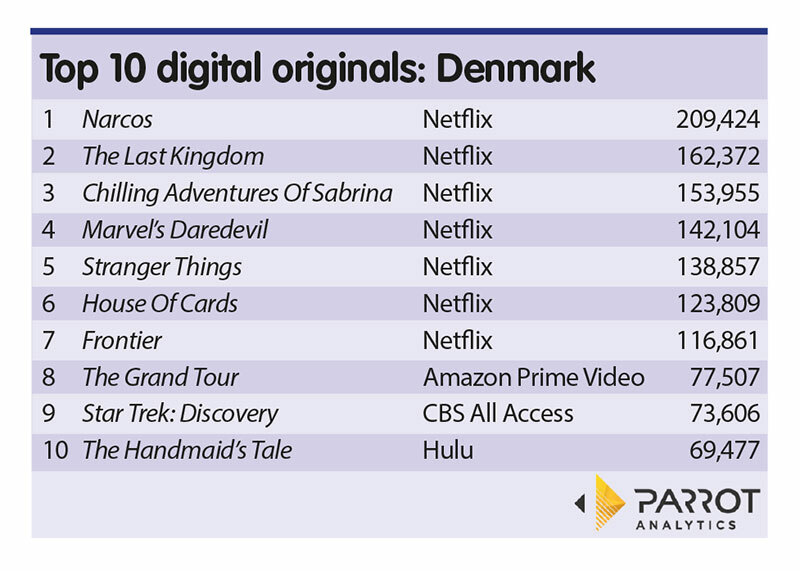 Narcos, the latest season of which is now streaming, led the pack by some way in the list of the top 10 most ‘in-demand’ digital originals in Denmark compiled by Parrot Analytics for the week ending December 2. The narco-trafficker drama, now set in Mexico rather than Colombia, the setting for the first three seasons, garnered an average of 209,000 demand expressions, well ahead of number two-placed The Last Kingdom in a Netflix-dominated list. 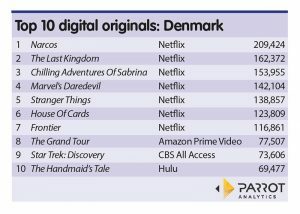 Netflix titles accounted for the top seven places in the Danish line-up, with Chilling Adventures of Sabrina taking third place, followed by Marvel’s Daredevil, Stranger Things, House of Cards and Frontier. Non-Netflix titles took slots seven to 10 in the list, all with an average of under 100,000 demand expressions. 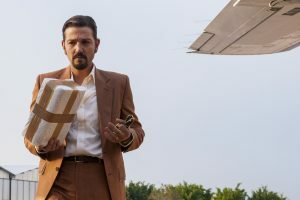 Amazon’s The Grand Tour took the seventh slot, with Star Trek: Discovery and The Handmaid’s Tale bringing up the rear.